Disability is a subject you may read about in the newspaper, but not think of as something that might actually happen to you. But the chances of becoming disabled are probably greater than you realize. Studies show that a 20-year-old worker has a 3-in-10 chance of becoming disabled before reaching retirement age. While we spend a great deal of time working to succeed in our jobs and careers, few of us think about ensuring that we have a safety net to fall back on should we become disabled. This is an area where Social Security can provide valuable help to you. Social Security will explain the benefits available, how you can qualify, and who can receive benefits on your earnings record. It will also explain how to apply for the benefits and what happens when your application is approved. In most cases, you will continue to receive benefits as long as you are disabled. However, there are certain circumstances that may change your continuing eligibility for disability benefits. For example, your health may improve to the point where you are no longer disabled. Or, like many people, you would like to go back to work rather than depend on your disability benefits. Social Security certainly encourages you to do so, and Social Security has special rules called "work incentives" that can help you make the transition back to work. These incentives include, but are not limited to, continued monthly benefits and Medicare coverage while you attempt to work on a full-time basis. •If medical improvement is "expected," your case will normally be reviewed within six to 18 months after your benefits start. •If medical improvement is "possible," your case will normally be reviewed no sooner than three years. •If medical improvement is "not expected," your case will normally be reviewed no sooner than seven years. Two things can cause Social Security to decide that you are no longer disabled and to stop your monthly benefits. •Your benefits will stop if you work at a level Social Security considers "substantial." Usually, average earnings of $1,130 or more per month ($1,820 or more per month if you are blind) are considered substantial gainful activity (SGA) for an individual. •Your disability benefits will also stop if Social Security decides that your medical condition has improved to the point that you are no longer disabled. When you start receiving disability benefits, certain members of your family may also qualify for benefits on your record. Each family member may be eligible for a monthly benefit that is up to 50 percent of your disability rate. However, there's a limit to the total amount of money that can be paid to a family on your Social Security record. The limit varies, but is around 150 to 180 percent of your disability benefit. If the sum of the benefits payable on your account is greater than this family limit, the benefits to the family members will be reduced proportionately. Your benefit will not be affected. 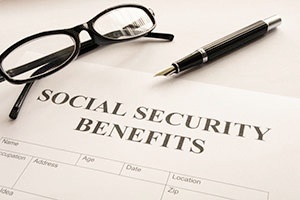 Are you applying or have you been Denied Social Security Disability Benefits?